If you’re missing a single tooth, you may have elected not to get your tooth replaced. While you may be under the assumption that one missing tooth can’t affect your oral health, it’s unfortunately not true. Unlike other parts of your health, dental health will get worse over time if it’s left untreated. The loss of a single tooth can lead to jaw bone density reduction, shifting of your remaining teeth, gum tissue deterioration, and even additional tooth loss. To avoid these serious health complications, it’s important that you contact us for a single tooth replacement in McKinney as soon as possible. To replace your teeth, we offer two different options: a fixed bridge and a dental implant. This tooth replacement restores the visible portion of your missing tooth with a dental prosthetic that is permanently fixed to your adjacent healthy teeth. A dental bridge is a prosthetic replacement connected to two crowns on either side. These crowns are attached to your healthy teeth to provide a sturdy support for your restoration. This option looks and feels like your natural teeth, and best of all, it prevents your teeth from drifting into the gap in your smile. 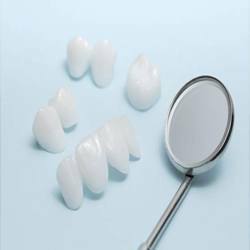 A single tooth implant is a more comprehensive restoration. 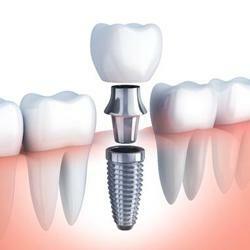 A dental implant is a small titanium post that is surgically placed in your jawbone. Because titanium is biocompatible, it fuses to your jawbone permanently to act as an artificial tooth root for your dental crown restoration. Surgical placement is minimally invasive and quick, but your implant will need three to four months to fully integrate into your jawbone. After, one of our dentists will place a natural-looking dental crown to restore your smile to its full health, look, and function. Implants preserve your natural tooth structure, whereas bridges require the removal of some of your tooth enamel to accommodate crowns. Dental implants stimulate your jawbone, keeping it strong and healthy. Dental implants in McKinney not only feel more natural, but they allow your restoration to mimic the way your teeth emerge from your gums. Implants can last 30 years and even a lifetime with proper care, but most dental bridges will need replacement after about 10 years. If you have a missing tooth and you’ve been putting off replacement, contact our office today to get started on a completely restored smile. 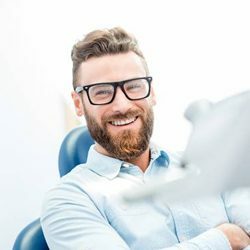 You’ll not only have more confidence to flash your grin, but you’ll be enjoying the many health benefits that come with replacing a single tooth.